A Soldiers Farewell to his Horse in Southern Flanders - front page from a drawing by Fortunino Matania. M. Briand With Sir Douglas Haig Touring British Lines; and at British HQ - full page (fp) showing x3photos. 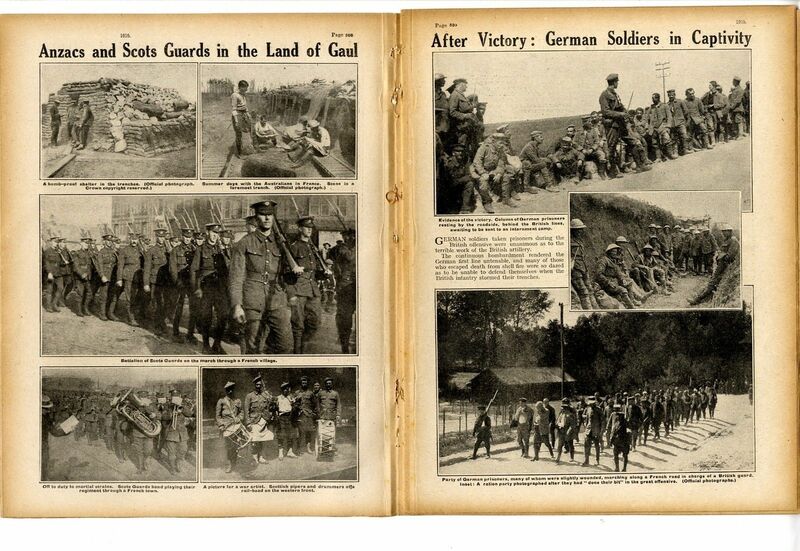 Anzacs and Scots Guards in France - fp showing x5 photos of trenches, sheLters, regimental band, pipers and drummers. German POW's Waiting To Be Sent to an Internment Camp x2pics. British Soldiers Wearing Captured German Headgear etc - fp x3pics. German Battleship Sunk off Jutland - fp page from a drawing by Charles M. Padday. French Soldiers Saluting British As They March Forward to the Front - fp from a drawing by A.W. Scottish Troops Attack at Mametz - fp drawing by Stanley L. Wood showing Scottish soldier about to attack a German with bayonet. Small Map: Indicating the Jutland Battle. London Navvies Digging Trenches in France - fp showing x2pics. Small tear to border of page. Gurkhas Reconstructing a Captured Trench. There is a small tear to the border of the page. 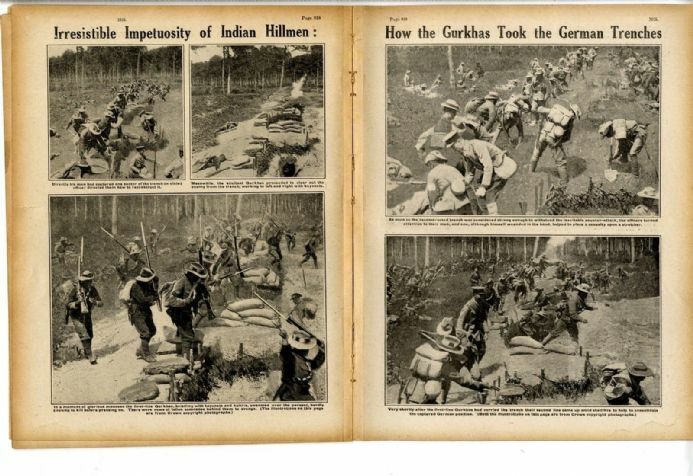 Gurkhas Clearing out The Enemy Working Left and Right with Bayonets. Swarming Over the parapet of a Trench with Bayonets Fixed. Gurkhas Coming Up Amid Shell Fire to Consolidate the Captured German Position. Inspection of Metropolitan Special Constables and a Platoon of St John's Ambulance Brigade by Colonel Sir Edward Ward and Hon. L. M. St. Clair. Company Quartermaster Sergeant E. S. Beech and Lance Corporal Vicker of 7th Battalion Seaforth Highlanders Playing Tunes on Their Mouth Organs Under Heavy Fire - fp from a drawing. Info. James Vickery b. 1897 in Walthamstow. British Troops Marching on Taveta Arcross a Drift of the Lumi River. British Engineers Rebuilding a Bridge Over the Lumi River. Armoured Car and Water Tank Automobile x2. Boring For Water at a British Camp. Destroyed Railway Bridge in the Advance on the Moshi Tanga Line. 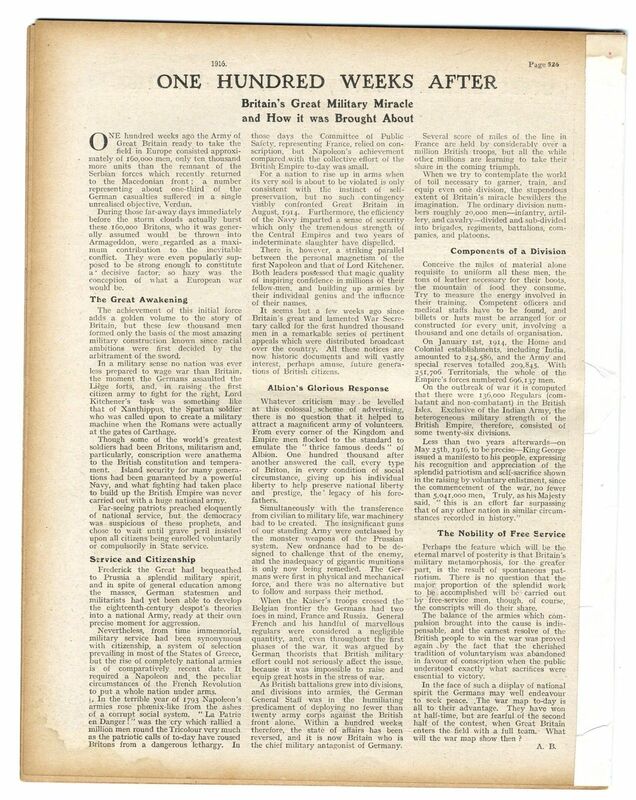 Article by Major G. W. Redway on teh Evens of the War: Fall of Antwerp - Festubert and Seddul Bahr - Townshend's Pyrrhic Victory - Rise of Brussilhoff. Gallipli and Wounded on Chocolate Hill - by H. W. Nevinson Special Correspondent in the Dardanelles giving an account of when he was wounded.Sleekburnc. The Great Sea Fight of Horn Reef (Battle of Jutland) - by Edward Wright. Please see main description link for content. If there is a particular date you require regarding this item please ask. An original used issue, not printed on the best of quality paper, but it more than makes up for this in terms of written content with many images. The four digit number in brackets in title is for my ref only. 11 pages (22sides). It measures 285mmx220mm (11.25 x 8.5") approx. The spine has been repaired/reinforced at some time. There is age yellowing and spotting/foxing and some marking. Some creases etc to corners and handling marks to edges. Images, sketches etc. vary in size.